Forget about cheap plastic toys. McDonald’s is bringing virtual reality to the Happy Meal in Sweden. 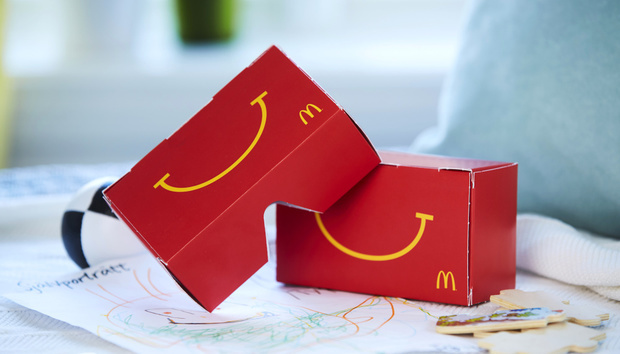 During the weekends of March 5 and 12, 3,500 Happy Meal boxes sold in 14 McDonald’s locations in Sweden will transform into Google Cardboard-style virtual reality headsets, as first reported by Adweek. The headset, called Happy Goggles, is the first global trial for what could be—or at least we hope could be—a wider international release. Happy Meal buyers take apart their boxes and re-fold parts of it into a cheap virtual reality headset. Then you slide your smartphone into the unit and away you go. The special event VR goggles coincide with Sweden’s Sportlov holiday, when many families head to the ski slopes. Along with the Happy Goggles boxes, McDonald’s created an accompanying web-based game called Se upp i backen that roughly translates to “watch out on the slopes.” The game teaches children about slope safety and is endorsed by the National Ski Team. The game will be available in English (known as Slope Stars) and Swedish on McDonald's Sweden's Happy Goggles website starting March 4. A McDonald's Sweden representative told PCWorld that (not suprisingly) the game will work with other VR headsets. The company recommends using a smartphone with a 4- or 5-inch screen to best take advantage of the game. There will also be a non-VR version available. Although McDonald’s designed the headset with a specific game in mind, I’m betting that Android users will also get a kick out of trying Google Cardboard-enabled apps with Happy Goggles. Why this matters: It’s still an open question if virtual reality will catch on with the general public, but it’s certainly off to a rousing start. McDonald’s is bringing VR to its iconic kid’s packs just as Google starts selling three different Cardboard units in the Google Store. On top of that you have headsets from HTC, Oculus, and Sony inbound. Then there’s Samsung’s Gear VR, LG’s upcoming VR headset, and VR accessories from LG and Samsung. With so much virtual reality action, at different levels of quality and availability, 2016 is shaping up to be an interesting year for the nascent consumer technology. UPDATE: This post was updated at 12PM Pacific Time on March 1, 2016 to add comment and more information from McDonald's Sweden.